If your work requires extra high visibility, MASCOT’s extensive selection of fluorescent safety workwear is just the thing for you. In the assortment, you will find, among other things, a wide selection of hi-vis T-shirts that make you visible at work, even during the warm months where it is too hot to wear jumpers and jackets. All MASCOT's hi-vis T-shirts are approved in accordance with the international standard EN ISO 20471 that outline requirements to visibility for employees who work in high-risk areas. 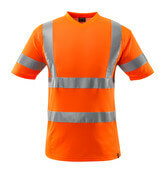 The fluorescent colours and reflectors ensure that you are visible both in daylight and in the dark. During the warm months when heavy jackets and long trousers are put on the shelf, it is still important to remain visible at the workplace. At MASCOT, you will find a selection of hi-vis T-shirts and shorts for the summer season, so you are guaranteed visibility regardless of the weather. 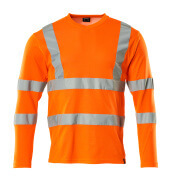 For the colder seasons, a large selection of trousers, jackets, jumpers, waterproof clothing and accessories of hi-vis materials are naturally also a part of the assortment. 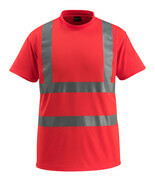 In the MASCOT® SAFE range, you will find both hi-vis T-shirts and polo shirts. These tops are approved in accordance with EN ISO 20471 class 2. The materials are chosen on the basis of sublime comfort and functionality. 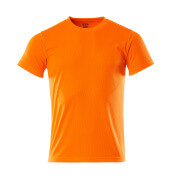 A part of the many hi-vis T-shirts are produced with polyester on the outside for the best durability and preservation of colour, while the inside is of cotton for the best comfort. MASCOT's hi-vis T-shirts are available in both a modern and a classic fit depending on whether you want a loose or a slimmer fit. Both models of course guarantee that you retain maximum freedom of movement. Choose T-shirts with elastic reflectors for extra high freedom of movement. MASCOT's hi-vis T-shirts are available in several different fluorescent colours depending on your preference and work situation. 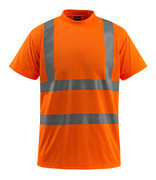 All T-shirts are fitted with reflectors so you remain visible when it is dark. If you need pockets, you will also find hi-vis T-shirts with hand pockets for storage of, for example, your mobile phone or glasses. If you wish to add a logo to your T-shirt, it is also possible - the requirements for the maximum logo size just need to be met, so the T-shirt still comply with the certification requirements.